I've been in Colorado Springs for 15 days now and the tournament is about to begin. Today is our last day of practice before our first game vs. Argentina tomorrow (Wednesday @ 5:45 p.m. MST). We had some great opportunities to scrimmage some of the teams that arrived in Colorado Springs early. Chile and Brazil were the first to arrive. Despite having no one over six feet tall, Chile was feisty and played hard but we had a considerable rebounding advantage. They ran good offense however and showed our post players how in international basketball they really need to be ready to defend on the perimeter. Our players made fast friends with them in the dorms because of their room proximity as well as their open friendliness. They speak a dialect similar to Spanish so they seem to be able to communicate well. Brazil will most likely be the toughest competition in our pool so getting a chance to see them early was beneficial. They are athletic and passionate. They cheer hard for each other and have a lot of pride in playing for their country. It was good for our players to see. Although we got out to a sizable lead, Brazil's press caused some problems for us late and showed us another area we needed to work on -- handling pressure. Then on Sunday, we scrimmaged Canada who is the favorite to win the Group A. Many of their players will end up on Division I programs in the US so they play the most similar to us. The game was close early, but our full court pressure and athleticism wore them down in the end. 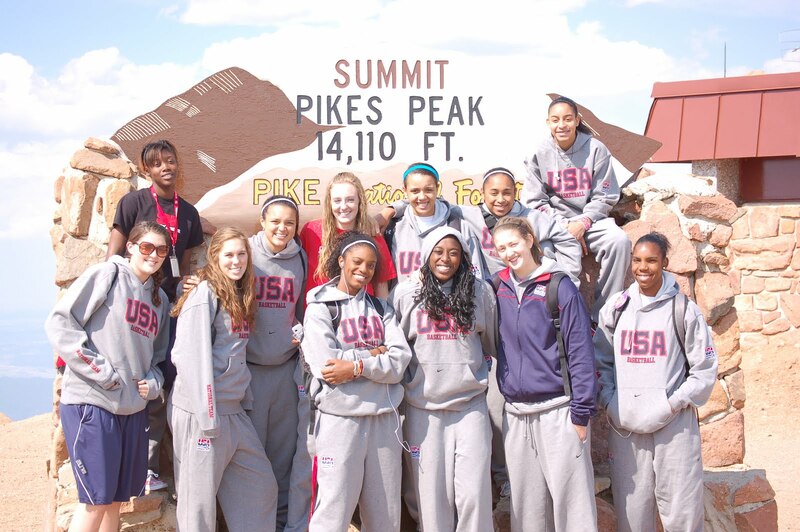 We played that scrimmage against Canada at Fort Carson in Colorado Springs. It was good for our players to see families at the base who had mothers, fathers, husbands and wives overseas fighting for our country. Sometimes they need a reminder that there are more important things than the mall, video games and texting. After two weeks of double sessions, we gave the players a much deserved afternoon off yesterday. We took the Cog Railway up to the top of Pikes Peak to give the team a chance to see something outside of the Olympic training center. It is the highest cog train in the world and climbs to over 14000 feet. At the top, you can see four different states and over 30 different peaks. My family arrived Saturday, so my mom and my boys came along for the ride. Holden and Conor were of course fascinated by the train. The players seemed a little bored until we reached Windy Point and they were able to really see the breathtaking view that inspired Katherine Lee Bates' song "America the Beautiful." Then the cameras came out and the sweatshirts went on. The top of the mountain was about 35 degrees so after bundling up, stocking up on snacks and trinkets, we made our way back down to the warmth of Manitou Springs. It's been a great ride so far, but the best is about to begin. 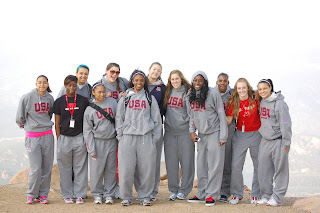 Opening ceremonies for the FIBA Americas tournament is tomorrow at 5:30pm and our first game starts right after. Pool play will consist of games against Argentina, Brazil and Puerto Rico and then the semifinals and finals will be over the weekend. Our players have worked really hard and I'm proud to coach them and represent the USA in these games.